Three waterfront, side-by-side rental homes in a private, quiet location face Oyster Bay on the south and a salt marsh estuary on the north. This location is very popular with visitors who like to be away from traffic and near nature. 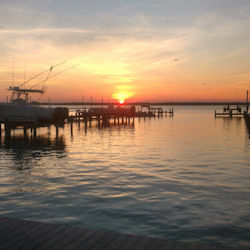 The dock on Oyster Bay is quiet and relaxing, and provides simply awesome sunrises as well as crabbing and kayak access. Some of the famous Chincoteague Ponies graze just outside the split rail fence surrounding the yards. Geese, ducks, ospreys, shorebirds, songbirds, bunnies, and deer frequent the area. Wifi is available at all houses, and guests are welcome to use the pool and fitness facilities at the Refuge Inn. 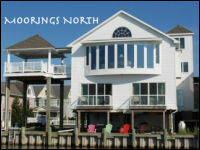 Enjoy a fun filled, soul restoring vacation in a SOS (Soul of the Sea) Vacation Rental! 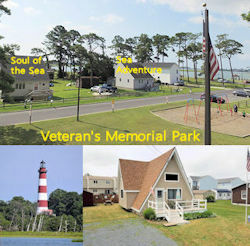 We have three clean and well appointed homes, 2 conveniently located at Waterfront Veterans Memorial Park and all less than 5 miles from Assateague Island, the Ocean and NASA! Something for everyone, amazing sunsets, museums, boat tours, kayaking, a family reunion, a wedding, a girlfriend trip, dad's or mom's weekend away, fishing or hunting, bird watching, cultural art festivities, everything on your wish list to have a wonderful vacation and so much more. Check out our website for all the details and find a treasure trove of valuable information to create the vacation that awaits you! We have improved our TV and internet service. Charter Communication has recently upgraded their service to digital. All of our homes will now have Charter 120 channels+ with local channels as well as individual, reliable 30 MBPS wireless internet. Plenty of speed to stream music, watch YouTube, Netflix or play games! Enjoy a new construction 3 bedroom, 2.5 bath townhome with an available boat slip walking distance from downtown and steps from the water! The townhome includes a partially enclosed parking/garage area, and includes five decks, all with water views. Guest rooms include one queen, and two king beds. 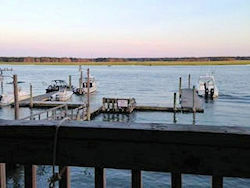 The location is ideal for fishing, crabbing, viewing fireworks, rocket launches, and beautiful sunsets, or simply enjoying nature from the dock. Short walking distance to the Carnival Fairgrounds. Guests are welcome to Wi-Fi and pool access. Please click on our link to learn more and see numerous photos of this well-appointed, lovely new townhome. 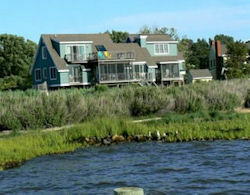 These waterfront homes are located on the northeast side of Chincoteague Island. There are deep water docking facilities to moor your boat, and you can go crabbing just outside of your door. 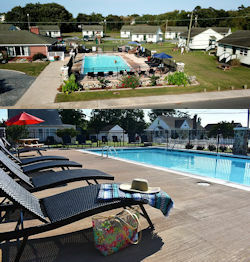 You have swimming pool privileges at Pine Grove Campground, which is within walking distance from both houses. Each house has three bedrooms and two baths. They also include central heat and air, a dishwasher, washer and dryer. Both houses have 1700 square feet of living area, a large deck cable TV, a VCR, and a stereo. Rents Saturday to Saturday only, Memorial Day to Labor Day, with a minimum of three days before Memorial Day and three days after Labor Day. LUXURY WATERFRONT CONDO - Another Day In Paradise is a beautiful bay front condo with spectacular water views! This condo unit is in the upscale Sunset Bay Villas, located on the Chincoteague Bay and just a short walk from Historic Downtown Chincoteague. Includes 3 bedrooms, 2 baths, hardwood floors, granite counter tops, beautiful decor, and amazing water views! You can see the bay from the living room, dining room, and kitchen as well as the Master Bedroom. Amenities include a fitness center, a marina, a swimming pool and much, much more. Please visit our web site to discover all the features our Sunset Bay Condo offers. Come and make wonderful family memories at Another Day In Paradise! This waterfront designer condo, 'Captain's Quarters' is located in the Sunset Bay Villas on Main Street and offers 'One of THE BEST Waterfront Views in the Villas'. Here is an example of what our guests say... 'We have stayed in other units here, but this one is surely the best of the bunch. The view is amazing and tranquil. It's quiet, elegant and relaxing. You won't be sorry making this your vacation destination. The unit is amazing'. A total remodel of this 2 bedroom, 1 bath condo has just been completed! We purchased this older condo and decided to totally remodel it because of the spectacular views. Everything is new ... new walls to new floor, a total new kitchen, HVAC, bath and furnishings! Enjoy beautiful sunrises & sunsets! Watch the annual pony swim from our covered balcony. Great boat slip available or slide your kayak off our floating dock! Crab or fish off the dock or just sit, relax and watch the wildlife. 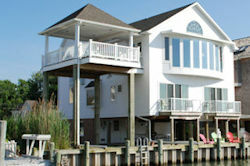 A stunning waterfront setting combined with impeccable accommodations... 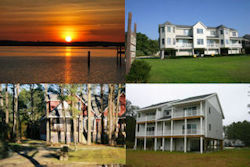 Eureka!, Epiphany and Morning Song are three luxury waterfront rental houses on Deep Hole Creek overlooking Little Oyster Bay and Assateague. 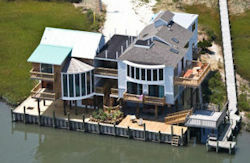 They all have deep water docks for swimming, boating and crabbing. They are two miles from the bridge to Assateague and the Chincoteague National Wildlife Refuge, and about a mile to the shops in town. Please see our web site for more details. 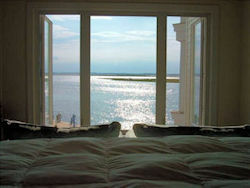 Eagle's View is a luxury vacation rental overlooking the Assateague Island Channel and Lighthouse. 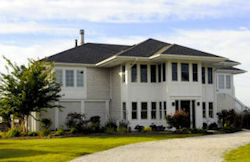 Fully equipped for comfort and convenience, with 4 BR, 3.5 BA, Wifi, 4 flat screen TVs, DVDs, washer/dryer, upscale furnishings and a kitchen with lots of gourmet gadgets, this house is your home base for quick access to beaches, hiking trails, museums, restaurants and shops, Eastern Shore attractions, and natural beauty. Wake up to beautiful sunrises, and spend lazy days enjoying the many kinds of birds, the frequent views of the ponies, and of course the gorgeous view of the lighthouse. Enjoy fishing, crabbing or boating from the private lighted dock that is also the perfect place for stargazing. There are plenty of outdoor, waterfront living areas for family gatherings, curling up with a good book, or enjoying the cool, salt air breezes: third floor balcony, generous deck off the great room, screened porch and dock. Come and enjoy the relaxation, peacefulness and tranquility that can be found at this gorgeous waterfront home. Beautiful sunrises, nature, and relaxation await you at Eagle's View. Easy Does It Vacations offers something for everyone from a single couple looking for a quiet time together to a growing family with small children, or a large family having an annual reunion. Our homes are all full size with complete kitchens, dining rooms, living rooms and plenty space to spread out the gang. 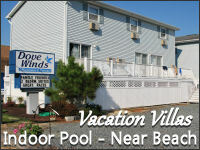 All offer Wi Fi, cable TV, DVD, VCR, A/C and lots of puzzles, games, and books about the island. There are even a few bikes to explore the island. All homes also have docks for your boat or to catch a few crabs. Take a Peak! Visit our Website. Check out our webcam, see what's happening on the dock. 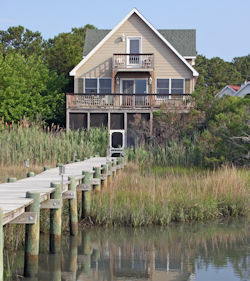 The Grey Heron is the perfect location for your Chincoteague Island vacation. This idyllic setting offers amazing views of the Chincoteague Bay. Experience unforgettable sunsets! Direct bayfront access right from the back yard allows for clamming, crabbing, kayaking, swimming, wading and other water activities. The Grey Heron is close to nature trails and hiking. Downtown is a lovely place to experience local food, shopping and views of the bay. Ride your bicycle to the beach and throughout town. Then head downtown for dinner or use the Grey Heron’s full kitchen to cook up your catch. Dine on the covered, screened porch and watch the moon rise and the stars appear. It’s an excellent place to savor an open-air breakfast and lunch during the summer and early fall. The large, efficiency apartment located bottom right is a quiet, separate addition to the main house. Enjoy your own private screened porch and parking. 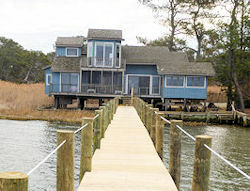 The large, private dock puts you up close with beautiful Chincoteague Bay. The shallow, sandy bottom is ideal for kayaks and canoes. Watch an endless array of birds pass by this serene natural wildlife setting, not to mention unparalled sunsets. Hosts, Jim and Jean Loeffert. Key West Cottages are nautical inspired, private waterfront accommodations with breath taking views of the Chincoteague Bay and Channel. Relax on the waterside balcony and breathe in the salty air! Located in the heart of historic downtown Chincoteague Island, you will find restaurants, boutique shops, and the Robert Reed Wafterfront Park. 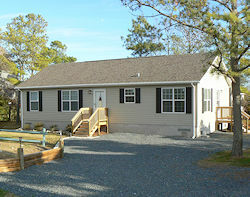 Also just minutes from the Chincoteague National Wildlife Refuge and pristine Assateague beaches and nature trails. Enjoy access to a shared Indoor Pool, Hot Tub, Outdoor Pool, Fitness Center and Laundry Facility at the Comfort Suites next door. Experience sunsets you’ll never forget! Watch the sun come down from the panoramic wall of windows in the great room, from two private balconies off of two spacious identical master suites, from the Gazebo-In-The-Sky, or the bulkheaded waterfront in your backyard. The elegant ambiance of this upscale estate will provide any amenities you are wishing for plus more. Ten guests sleep comfortably in three king size, and four twin size beds. Moorings North is designed to easily accommodate bigger families as well as to offer a tranquil setting for a romantic getaway. Enjoy many of the wonderful attractions Chincoteague has to offer while pamper yourself in a vacation home you are cordially welcome and promised to enjoy your vacation time to the fullest. Large, brand new, 3 bedroom, 2 1/2 bath home with lots of room and privacy for every family member! Located in a quiet neighborhood just minutes from downtown. This new home is modern and spacious. Enjoy water view and use of private dock where you will find cooling breezes, natures wonder, and passing birds. Every evening, Mother Nature creates an original masterpiece of her endless sunsets, making for a great photo opt! Myrtle on Mumford is a newly-constructed home that combines character and charm, reminiscent of Chincoteague Island life a century ago, with the upscale finishings, furnishings, and amenities of today. The home features two bedrooms, one bath, a dining area with seating for six, a living room, a contemporary gourmet kitchen, and central heat and air conditioning. The house is located in the downtown Main Street historic area, less than a five minute walk from town. 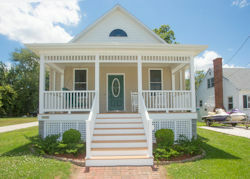 Myrtle on Mumford is the perfect home for your Chincoteague Island getaway. We invite you to explore our web site. You will be pleasantly surprised! 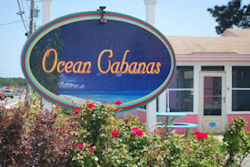 Ocean Cabanas is ideally located on Maddox Blvd, within walking distance of Restaurants, Ice Cream Parlors, Miniture Golf, Go-Karts, Bumper Boats, Arcades and Gift Shoppes. 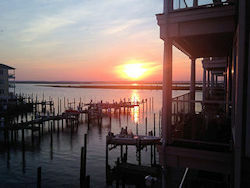 We are just minutes from the entrance to the Chincoteague National Wildlife Refuge on Assateague Island and the beach. Each cabana has two bedrooms and screened porch with patio furniture & ceiling fan, color TV, DVD player, CD player VCR and air conditioning. Sleeps 6. Pet Friendly. 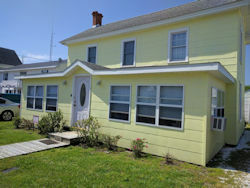 Lovingly restored 3 bedroom, 2.5 bath older home, "in town" on the Island, near the old firehouse and the harbor. Walk to restaurants, shops, library, town dock, boat ramp, grocery store, and historic area on Main Street. Across the street from Muller's Ice Cream and the Hot Stuff shop. Just a ten minute drive to Assateague Island and the ponies! 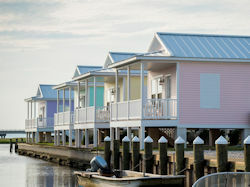 We have many cottages to offer from one bedroom cottages to three bedroom Chincoteague style homes. 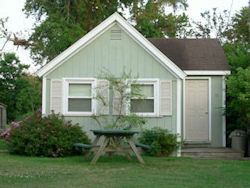 All the cottages are within walking distance to town and the carnival grounds. Off the beaten track, these homes offer convenience, privacy and quiet relaxation. Plus pool privledges at Sea Shell Motel. 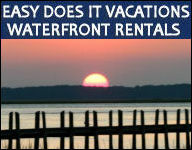 Looking for an affordable Chincoteague Island vacation? Need more space than a hotel room? Steve's Cottages is what you've been looking for! 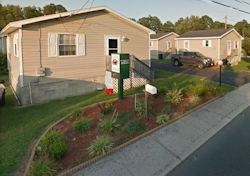 Steve's Cottages are located on a quiet side street within walking distance to the historic downtown area and just one block away from the restaurants and attractions on Maddox Blvd. After a long day at the beach relax in our pool!